No cost to attend, but space is limited. Please RSVP to 800-258-5064 or online at KingwoodMedical.com/calendar. HCA Houston Healthcare-Kingwood is pleased to offer free monthly seminars featuring our own medical experts presenting the latest information on a variety of health topics. Each seminar is interactive, includes dinner and will be followed by a Q & A Session. 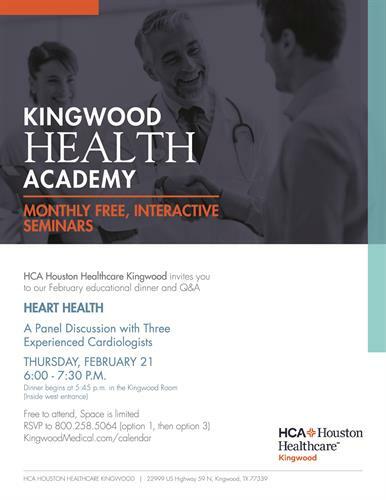 Please join us as we explore another essential health topic at HCA Houston Healthcare-Kingwood's Health Academy. We will be joined by a panel of three experienced cardiologists to discuss current trends and answer your questions. Dinner is included, and space is limited, so please register online at KingwoodMedical.com/calendar (search for Kingwood Health Academy or by date... February 21) or call 800-258-5064.